Deep Space Station 43 officially opened in 1973. It remains the largest steerable parabolic antenna in the Southern Hemisphere. Deep Space Station 43 (DSS-43) was constructed in 1969 to 1973 as a 64-metre diameter antenna. 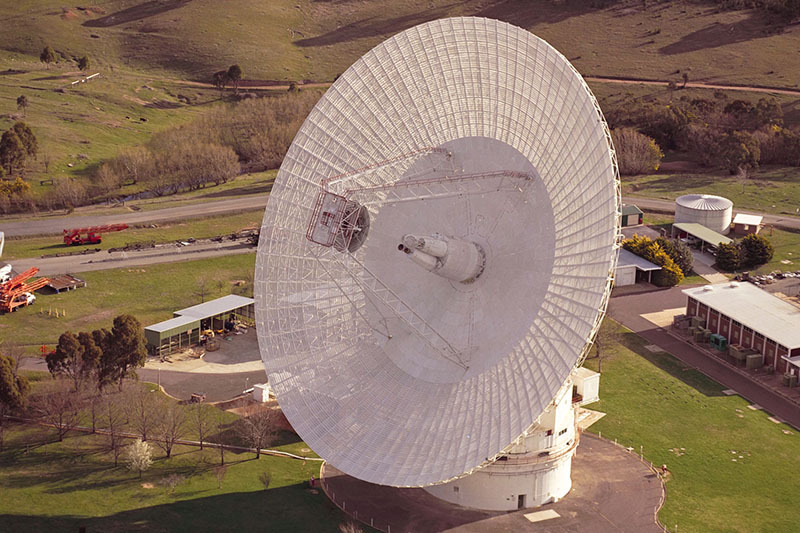 The 64-metre antenna was more than six times as sensitive as DSS-42, the original 26-metre at the Complex. Therefore DSS-43 could communicate with spacecraft at greater distances from Earth as the signal became weaker. DSS-43 supported, as needed, the Apollo 17 mission to the Moon before the antenna's official opening in 1973. DSS-43 was extended from a 64-metre diameter antenna to a 70-metre diameter in 1987 to enhance its capabilities for the Voyager 2 1989 encounter with Neptune. It is the largest steerable parabolic antenna in the Southern Hemisphere. The massive structure, weighing more than 3000 tonnes, rotates on a film of oil approximately 0.17-mm thick. The reflector surface is made up of 1,272 aluminium panels with a total surface area of 4180 square metres. The outer panels are perforated, allowing rain and wind to pass through them. Find more photos of Deep Space Station 43 in our Gallery.